Today is once again a premiere day here on the blog because today’s article deals with a topic that has not yet been on the agenda before. It’s just three days since I dropped the name “Appeljack” as part of the Helter Skelter cocktail, which is essentially an American fruit brandy. Applejack is often used as an ingredient in American cocktail recipes. 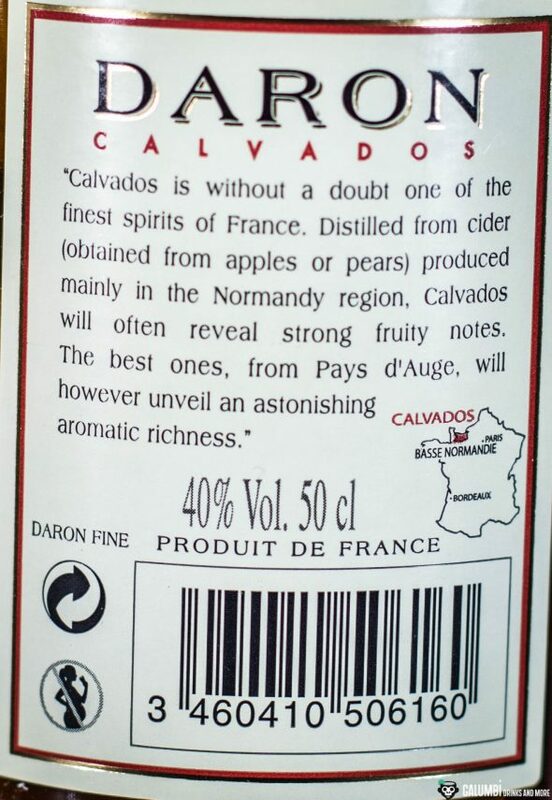 In Europe, instead of Applejack, however, people usually use the nobler Calvados. And that is exactly what today’s article is about. In fact today’s article is about two different Calvados bottles, which come from the same manufacturer. But before I go into details, I would first like to elucidate some general principles on the subject of Calvados. Calvados can look back on a much older history compared to the American Applejack. First written records of Calvados or Calvados predecessors date back to the middle of the 16th century. Nevertheless, it did not reach its heyday until the second half of the twentieth century, where it was first regulated by law and the production of Calvados became restricted and bound to certain criteria. Basically, Calvados is a barrel-aged Eau de Vie, but there are four different types of Calvados, all of which are regionally protected products of the Normandy region in France and differ slightly in their manufacturing rules. There is the regular Calvados, the Calvados Pays d’Auge, the Calvados Domfrontais and the Fermier Calvados. The Fermier Calvados is essentially a loose generic term for all those Calvados bottlings which were produced on a single farm according to ecological standards and the category is combinable with others. However, the most frequent representatives are from one of the three other categories. Before these differences are taken into consideration, it is important to remember that Calvados is not (as is commonly suspected) made from apples only, but also uses pears as a base resource. This is especially reflected in the Calvados Domfrontais because while the regular Calvados does not require the addition of pears (but allows it, of course), the Domfrontais must be made from a basis of at least 30% pears. In addition, the Domfrontais Calvados must mature for three years in the barrels (instead of two years for regular Calvados). The Calvados Pays d’Auge, on the other hand, is a more stringent quality version of the regular Calvados. It must be made in the Pays d’Auge region, it must be double distilled and the basic “cidre” must ferment for at least six weeks prior to the distillation. 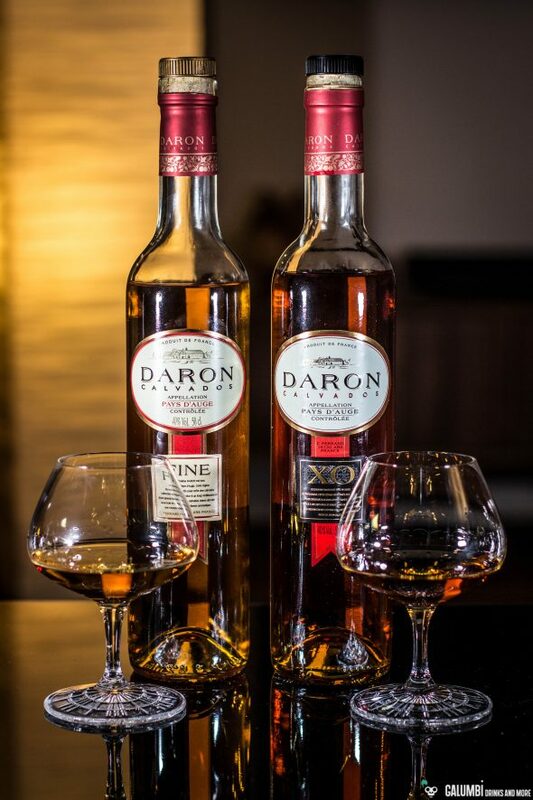 The two bottles I would like to present today come from the house of Daron and belong to the last of the presented categories and therefore bear the name “Pays d’Auge Calvados” on their label. The manufacturer claims to have specifically chosen bitter and bitter-sweet apple varieties for its Daron Calvados, namely Bisquets, Bedan, Petit Joly and Saint Martin. I accept this information at this point and can’t say anything well-founded about it because I simply lack the necessary expertise about apples. Also pears find their way into the basis for this Calvados to guarantee a somewhat fresher character. The cidre that is formed after the fermentation is now distilled in copper pot stills and finally matured in limousine oak barrels. 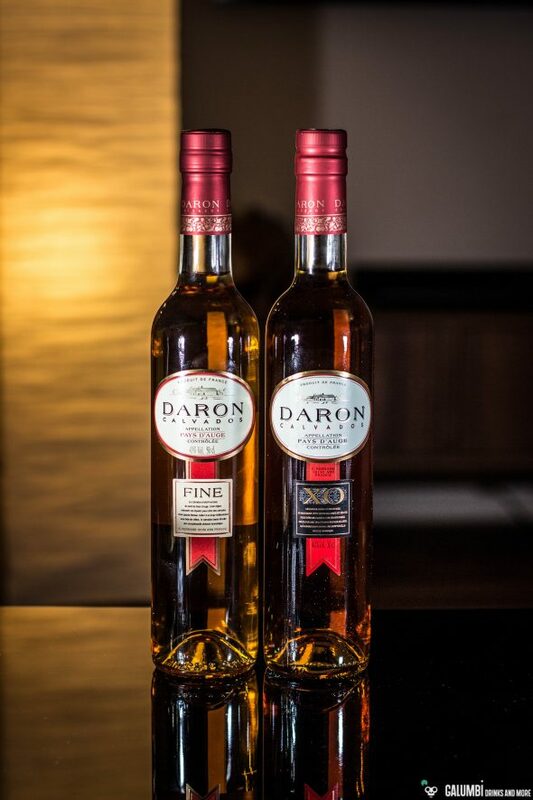 The final blend is made by Daron’s cellarman, who marries the content of different barrels in order to achieve the final product. As it is the case with most French spirits, Calvados also has a variety of age classifications ranging from “Fine”, “Trois étoiles” or “Trois pommes” (which have to mature for at least two years), “Vieux” or “Réserve” (which have to mature for at least three years), “Vieille Réserve “, or” VSOP” (with at least four years of age) to finally the oldest category of “XO”, “Extra”, “Napoléon”, “Hors d’Age” or “Age Iconnu” (with at least six years of age). The bottles presented today come from the youngest and from the oldest of those categorys. 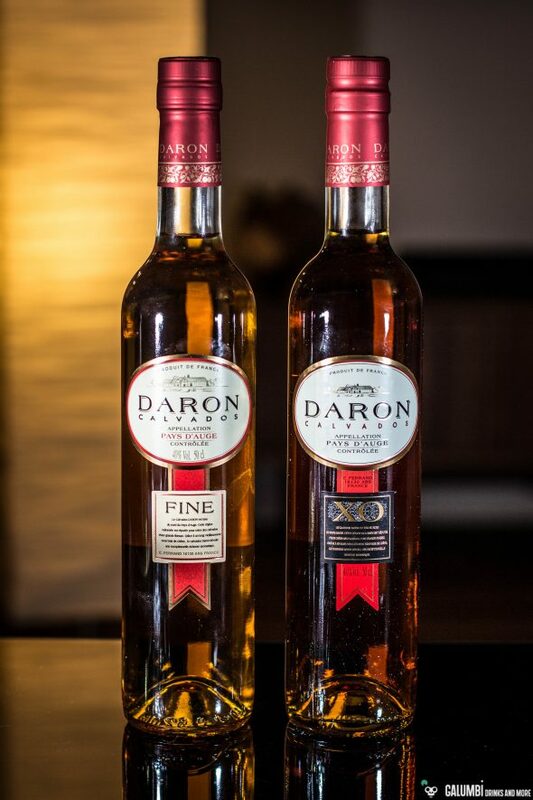 The manufacturer speaks of a “Tasting-Age” of 5 years for the Daron Fine and of a “Tasting-Age” of 15 years for the Daron XO. 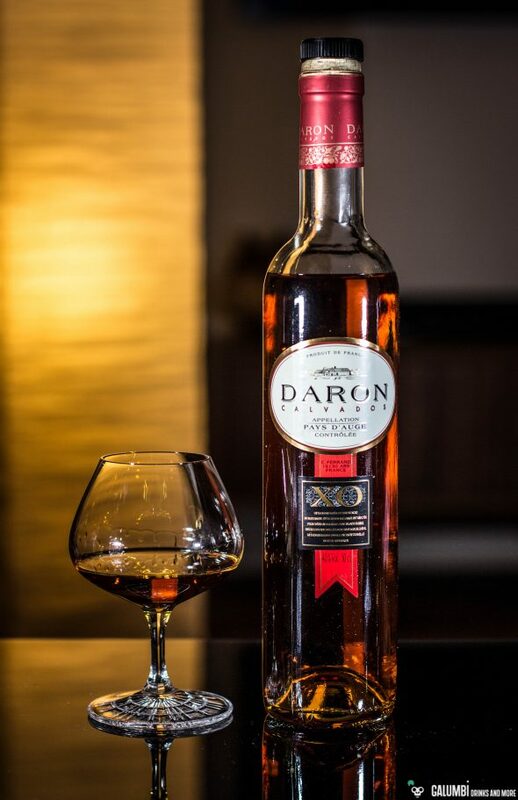 So if you are wondering now, why the Daron Fine is not a Daron VSOP with its alleged 5 years, you have to look closely because here we are dealing with a small marketing trick: the “tasting age” is not the real age but the “felt age”. That means it “tastes like a 5-year-old Calvados” but it is none. At least the manufacturer tells us. Personally, I don’t need such play of words about “tasting ages” because they simply create confusion in an industry in which the overview about different age regulations for different kinds of spirits is far from being an easy and clear one. However, both bottlings promise to be of high quality. I also like the bottle design very much. It makes an elegant and sophisticated impression. Both age classes are filled with 40% vol. They cost about 25 Euro (Fine) or 40 Euro (XO) per 0.7 liter. Aroma: On the nose the first impression shows aromatic, full-bodied apples, which remind a little of compote. The velvety sweetness of pears is also noticeable, and very harmoniously joins hands with the apples. A beautiful vanilla is added to this and subtly underlines the overall impression. After a while, fine oak tones also emerge and a fine and vinous freshness comes up. Associations of nutmeg and cinnamon. 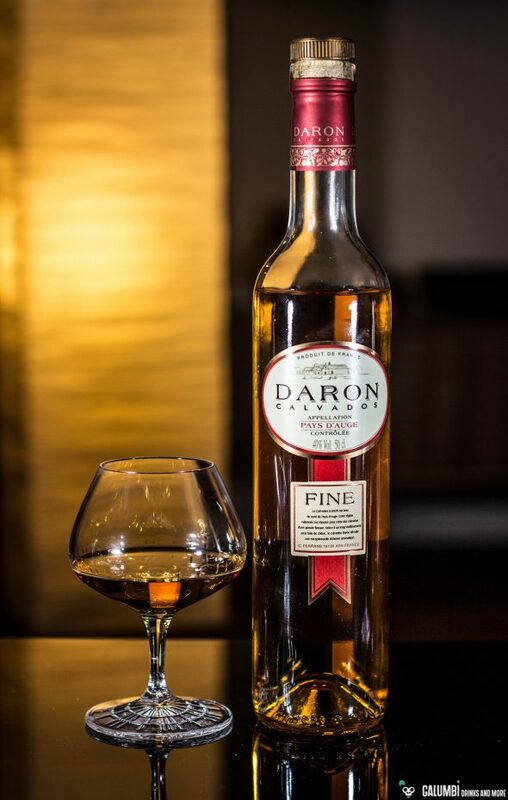 Taste: The Daron Fine also offers a very pleasant taste on the palate with aromatic apples and the velvety pear which was also noticeable on the nose. It is sweet with hints of spices (but not comparable to sweetened apple brandies or Applejack) and develops a certain freshness. I can isolate cinnamon and apple stalks. Aroma: Aromatic apples and a slightly more subtle pear are also present here, but they appear in a much more matured frame that is carried by honey and vanilla. I’m almost thinking of apple pie because there is definitely the aroma of some sweet cookie or cake dough inside. A little fresh and vinous character has also been preserved in the XO but it has stepped more into the background. The amount of oak has increased. Taste: Apples and pears are spicy and sweet, with very present oak wood. Cinnamon and nutmeg take away the more immature impression of its younger sibling. Correspondingly, the apple stalks have almost disappeared and an aromatic honey has taken its place. My résumé is a very positive one. Both bottles made a very good impression and are absolutely recommendable for enjoying them neat. As a cocktail ingredient they are also very interesting and I will surely let some ideas follow in the next weeks. Until then I can recommend using it inside of the Widow’s Kiss.